Life is hard for famous people. You’re trying to @ reply with your celebrity friends on Twitter, but the conversation gets drowned out by rabid fans and spammers mentioning you. So Twitter’s begun rolling out to people with verified profiles two new filters for the Connect tab. 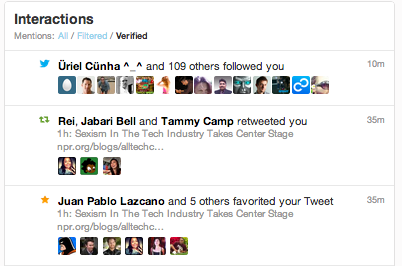 Filtered, which attempts to cut down spam, and Verified, which only shows interactions with other verified profiles. Twitter noted the rollout earlier today and you can see them below in this screenshot, though. Keeping celebrities active and happy on Twitter is a big business for the company, which just filed its S-1 to go public today. Celebrities and their tweets are a big draw for users, who visit Twitter to absorb the latest updates from the actors, athletes, musicians, and other famous folk they love. Twitter capitalizes on that engagement with ad views, so the more celebs enjoy Twitter, the more money it makes.